Let me thank my baby for the opportunity to see Manila Zoo Philippines. If not for her, I won’t even get to visit the place. Speaking of babies, for everyone who plans to bring their own children to this popular zoo, this article serves as guide prior to your trip to Manila Zoo Philippines. I’ve always wanted to see Manila Zoo since childhood. Although not all kids are the same, especially kids of today, a lot will still appreciate wild life featured in this zoo. In fact, despite being old and under appreciated, this zoo still lists millions of visitors yearly, most especially during weekends. You’d find local Metro Manila residents dropping by as well as tourists from various parts of the country. Manila Zoo was opened to the public on July 25th, 1959. The zoo’s administration was able to take care of more animals before. The animals are fewer now as compared to a decade or so ago, even if they have about 500 animals as of the moment. As an example, there’s only one elephant left in the zoo. 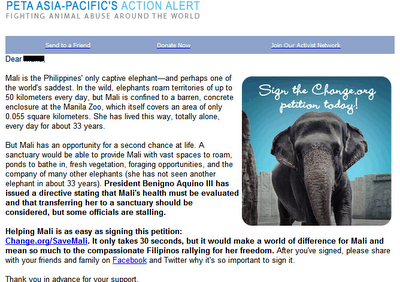 Maali (Vishwamaali), a 38 years old Asian elephant from Sri Lanka is even the only elephant in the Philippines. Her loneliness had been the subject of scrutiny lately. Animal rights activists complained that the poor giant is unable to move about freely in a limited area. In fact, she can’t even stretch her foot enough. This then lead Pres. 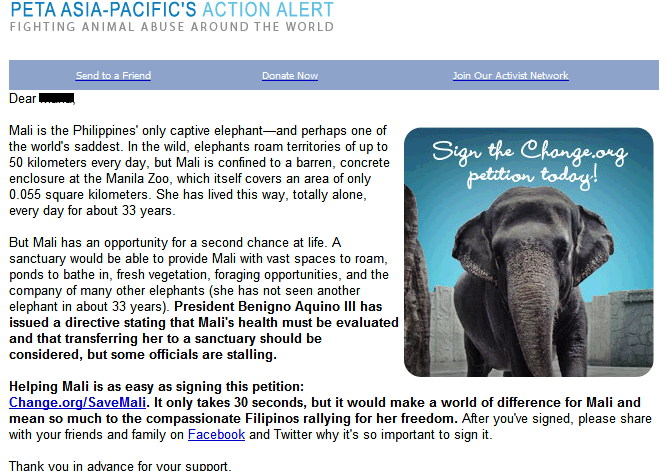 Noynoy Aquino to order an evaluation of Maali’s health and to have her transferred to a sanctuary. PETA or People for Ethical Treatment of Animals even volunteered to shoulder expenses to transfer Mali to a sanctuary in Thailand where she can spend what remains of her life comfortable and with her kin. The zoo refused. Aside from Mali, there are more animals to see in Manila Zoo. Some of which include various species of birds or fowls, reptiles including snakes, lizards and crocodiles, tigers, monkeys, zebra, hippopotamus, wild pig, cows, and more. Among all animals present, birds including eagles, owls, and more have the most number. In fact, some of them are not even inside cages including that big dome where birds can fly at a vertically extended confinement. A lot of them are freely wandering all over the zoo. You’d actually see nests on top of huge, ancient trees. You can even feed them near the man-made lagoon. I’m sure not all of them are relatively part of the zoo. There are migrating birds that intentionally fly all the way to Manila Zoo because of the trees, free food, and the presence of other birds. Speaking of birds, look for the photo booth where you can take pictures alongside tamed birds. If you didn’t bring a camera, there are photographers who offer their services in the area. Manila Zoo is actually called Manila Zoological and Botanical Garden because aside from the zoo of animals living in the area, there is also a botanical garden incorporated within the zoo. You’d find flowers, orchids, plants, and trees originating not only from the Philippines but from other regions as well. This is where you can take your kids when they’re tired of watching animals inside cages. Here, they can actually interact with the animals including snakes, birds, and more. There’s just an entrance fee of Php 200 on top of the entrance fee to the main entrance of the zoo. Since fees are mentioned, entrance fee is only Php 20 pesos for Manila residents (with proof of residency required like an ID showing your address will do) and for children below 4 feet. It’s Php 40 for adults on the other hand. Other worthwhile treats you can spend money for include boat and horse rides. Both of these cost Php 60 each. The zoo is open daily from 8 AM to 6 PM including holidays. Wherever you’re coming from, the main goal is to reach Quirino LRT Station so you can take a jeepney or a pedicab ride to Manila Zoo after. Sorry, not good with directions. If you’re an animal rights activist, you’d definitely not appreciate this zoo or any other similar setup for that matter. But if you have loved this place since childhood, you might want to consider helping out. The place needs more funds. The stingy smell in the area is proof enough. We all would like to see Manila Zoo Philippines be the best that it can be and it’s animals well cared for. I received an email inviting me to participate in the campaign to save Mali. The image below shows the content of the email which I'd like to share.